Let's start be defining exactly what by passing a variable reference and by value actually means. 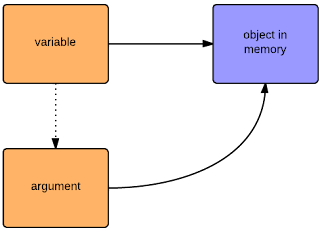 If a parameter is being passed into a function by reference it means that only a reference to the variable is being passed into the function is passed as the argument. The variable in the function and the variable that is passed into the function are actually pointing to the same location in memory. Put simply, if the value is modified inside the function the original value is also changed. If a value is being passed into a function by value it means that a copy of the variable is being passed into the function. The variable in the function and the variable that is passed into the function are two separate variables. Put simply, if the value is modified inside a function the original value will remain unchanged. The parameters of a function call are the function's arguments. Arguments are passed to functions by value. If the function changes the value of an argument, this change is not reflected globally or in the calling function. 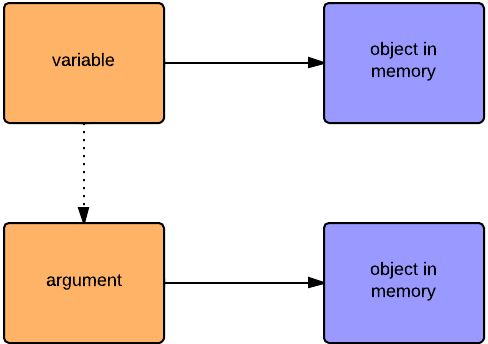 However, object references are values, too, and they are special: if the function changes the referred object's properties, that change is visible outside the function. At this point you might be asking yourself, what about primitive datatypes like strings and numbers? The truth is that the point is quite moot since primitives are immutable, which means they cannot be changed. When a primitive is changed a new variable is created and reassigned to the original. 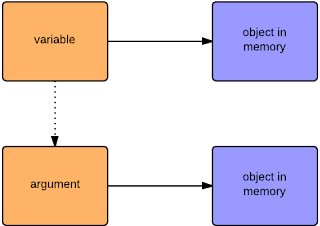 Since this reassignment happens every time a primitive is changed it doesn't matter, the primitive will never point to the original location in memory once its changed so you'll always end up with the same behavior as if it was being passed by value.